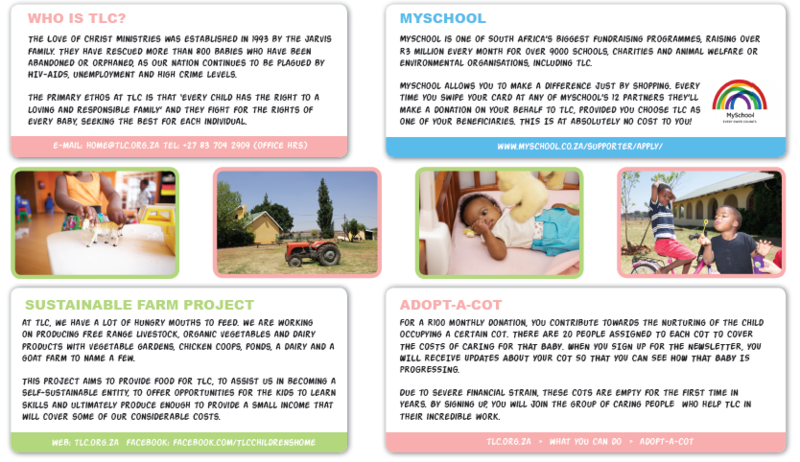 This week we are featuring an amazing Children’s home, situated in Eikenhof Gauteng, called TLC. If you have some time this feastive season, please go to TLC and be a blessing to this amazing home! In a country where more than half the population lived in appalling conditions, with very little income, in families torn apart by urbanisation and legal restrictions, The Love of Christ Ministries was established by the Jarvis family to rescue the tiniest victims of a society in turmoil. Since we rescued our first two little ones in April 1993, we have continued to play a part in changing the destiny of more than 780 babies who have been abandoned or orphaned, as our nation continues to be plagued by HIV-AIDS, unemployment and high crime levels. That in itself has been a great challenge for us, but we are dedicated to more than just saving babies. Our primary ethos at TLC is that “every child has the right to a loving and responsible family”, this requires us to do more. Every baby at TLC is a part of our family, we hold each little one dear, we fight for the rights of every one, we seek the best for each individual, always. Being committed to this belief has meant that over time we have had to grow. Our family has grown from five children to almost thirty; Our nursery accommodates another thirty little babies between birth and three years; We are assisted by a fantastic international team of 16 – 24 volunteer caregivers. We employ a number of staff members to assist with administrative and domestic duties. And we now report to a board, who assist us in ensuring we keep sailing in the right direction.